• Jon Treadway, a junior music performance major from Scottsburg, Ind., on piano. • Vocalist Ross Hanson, a junior music education from Evansville, Ind. • Vocalist Kaitie Moore, a senior theater major from Boonville, Ind. • Vocalist Jacob Riley, a sophomore music education major from Cicero, Ind. • Vocalist Julia Powell, a junior vocal performance major from Shelbyville, Ind. 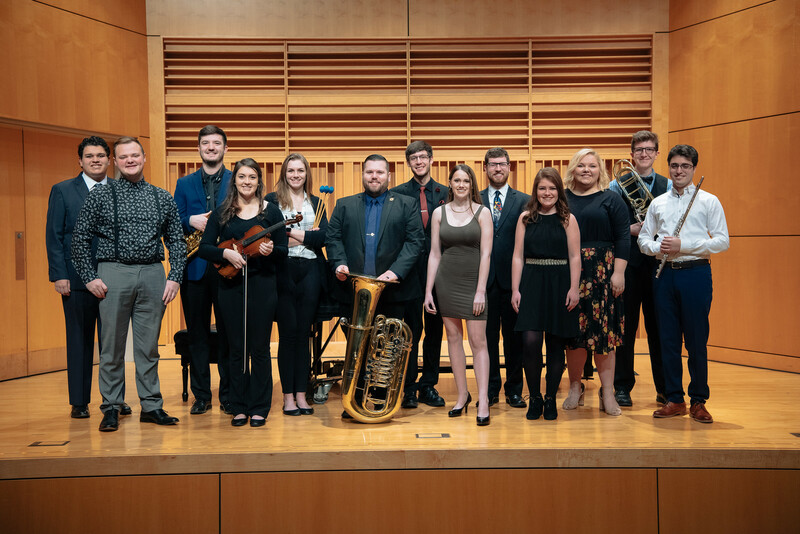 • Vocalist Loren Heck, a freshman vocal performance major from Troy, N.Y.
• Chandler Ellis, a junior music performance major from Sheridan, Ind., on bass trombone. • Vocalist Logan Muñoz, a choral music education major from Portage, Ind. • Nick Puchek, a senior music education major from Highland, Ind., on tuba. • Percussionist Taylor Moga, a music education major from Kendallville, Ind. • Ricardo Gil, a senior music performance major from Santo Domingo, Dominican Republic, on flute. • Ben Moan, a junior music education major from Greenfield, Ind., on saxophone. • Vocalist Zene Colson, a senior music business and music liberal arts major from Brazil, Ind. • Abigail Bakotic, a sophomore health sciences major from New Lenox, Ill., on viola. The concert is free and open to the public. A reception provided by the President's Office will immediately follow the performances.